First Division side Partick Thistle will face Rangers in a quarter-final replay after coming close to causing another Scottish Cup upset. Thistle appeared unfazed to be playing the SPL leaders and gave their more illustrious opponents little room in the first-half at Ibrox. Damon Gray triggered wild celebrations in the Thistle end with a composed finish in the 67th minute. But their joy was shortlived when Kris Boyd equalised two minutes later. CIS Cup final hero Boyd was rewarded for his scoring exploits with a place in Rangers' starting line-up against Partick. Rangers manager Walter Smith made six changes to the side which started at Hampden with Charlie Adam, Steven Whittaker, Kevin Thomson, Steven Naismith and Nacho Novo all given starts. Barry Ferguson missed out with an ankle problem, while David Weir, Sasa Papac, Brahim Hemdani, Chris Burke and Lee McCulloch were all rested. Partick made two changes from their goalless draw with Morton. In came Simon Donnelly and Gary Harkins, out went Willie Kinniburgh and Stephen McKeown. Rangers were sluggish early on as the visitors looked to add to a week of Scottish Cup upsets. Mark Roberts sent Gray clear with a defence-splitting pass and his effort was palmed away for a corner by McGregor. Adam spurned a great chance just before the half-hour mark when he fired wide after a quick counter-attack and good work by Novo. Jonathan Tuffey saved well from a Cuellar header in the 42nd minute when he rose powerfully to meet Adam's corner. Naismith struck the bar with a header after he connected with Davis' cross after 56 minutes. Partick stunned the Ibrox crowd when they took the lead in the 67th minute. 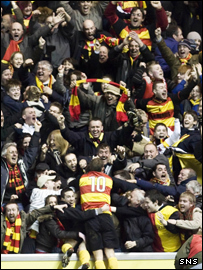 Can Partick win the replay at Firhill? Harkins played a clever ball down the right-hand side of the box with the Rangers players claiming for offside, but Gray timed his run perfectly before clipping the ball over the advancing McGregor. The visiting fans were still celebrating when Rangers scored a scrappy equaliser. Burke's shot was blocked and, with the Thistle defence unable to clear their lines, the predatory Boyd was on hand to force the ball home from close-range. Rangers pressed for a winner but Thistle held on to ensure a replay at Firhill. 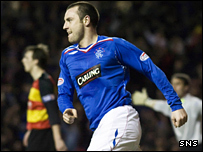 Rangers: McGregor, Broadfoot, Cuellar, Dailly, Whittaker, Naismith (McCulloch 72), Davis, Thomson, Adam (Burke 58), Novo, Boyd. Subs Not Used: Alexander, Steven Smith, Furman. Partick: Tuffey, Storey, Robertson, Archibald, Twaddle, Chaplain (McStay 90), Rowson, Roberts, Harkins, Gray (Murray 84), Donnelly (McKinlay 70). Subs Not Used: Hinchcliffe, Kinniburgh.